After the initial trauma of a car wreck, the concerns of insurance coverage are real. Does the party at-fault have insurance and is it enough to fully compensate for all injuries and losses? Will there be adequate coverage to fully cover future medical care, lost wages at work, and permanent injuries? Connecticut law requires insurers to sell you Uninsured and Underinsured (UM/UIM) Coverage of at least $20,000 per person and $40,000 per accident. You can buy more coverage than the minimum, which is strongly recommended because often the responsible party’s coverage is insufficient. The number of uninsured/underinsured drivers in the state of Connecticut is significant. UM/UIM insurance covers you and family members in your household. This coverage protects you from an uninsured or underinsured driver. 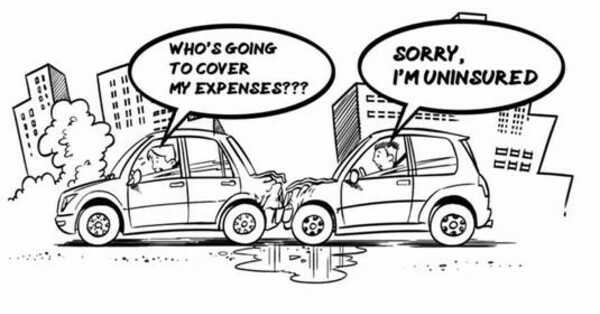 How does UIM (Underinsured Motorist) Coverage Work? When you are in a wreck with an underinsured driver, you must exhaust their insurance coverage and then seek additional damages in the amount of your UIM coverage. Your UIM coverage will be credited for what was paid by the responsible party. Let’s say you are hit by a driver and severely injure your shoulder, requiring surgery. The driver had insurance in the amount of the state minimum ($20,000 per person / $40,000 per accident). You have UIM coverage in the amount of $100,000 per person / $300,000 per accident. After you collect $20,000 from the underinsured driver, you can collect up to $80,000 from your UIM coverage, for a total of $100,000. Let’s take the same example but you only have the minimum required for UIM coverage, $20,000 per person/$40,000 per accident. You can only collect the maximum from the other driver and cannot get anything rom your UIM coverage because you already received $20,000 from the driver’s insurance. Conversion coverage will pay as additional coverage regardless of the responsible party’s coverage. with an underinsured or uninsured motorist to know your rights! John Buckley handled my case and John Parese fought for me in court. These guys are honest and fair, 10/10 would recommend! Never have I ever come in contact with an attorney like John! John Parese has heart and soul and has the drive to get the job done. By far, John is the attorney you want to have by your side to represent you. You can trust him with your future and your life. I know I did! I could not thank them enough! I highly recommend them! I have dealt with John Buckley for over 2 years from a car accident I was in, my experience was FABULOUS! John handled everything, he and his staff were so helpful and made the overall experience of an unfortunate event very stress-free! I could not thank them enough! I highly recommend them! Thank you so much for all the support you give to MADD Ct. It is an honor to have you part of us. Words could never express how much it means to us! You’ll never top these guys. Looking for the best lawyers around to represent you? You just found them. Don’t bother looking anywhere else. You’ll never top these guys. Attorney Parese came highly recommended! Attorney Parese came highly recommended as someone with both a legal expertise and a personal touch. In the end, both turned out to be exactly the case. John was a regular at our kitchen table reviewing progress along the way. Now, years later, we are still exchanging holiday cards! They give back in their communities! I can highly recommend them for personal injury law. They are not only great attorneys but they give back in their communities! Thank you for all your help and support. Jim and I really appreciate it. Thank you for the baby basket it was very thoughtful and generous. Thank you John Parese for your support in these two years was really appreciated! I want to thank you so very much for all your help especially when I was a nervous wreck over some things. Thanks for helping me with the MV accident! My family and I will always be grateful to you and your awesome staff for assisting me. Your kindness is deeply appreciated! Thank you for being so supportive through all of this! Thank you for all that you did for us! We just wanted you to know how much it meant to us, thanks again for everything! You have helped me beyond words! Thank you again for taking the time out of your busy day to come up to New Britain court with me to help me with my MV case. I am forever grateful, thanks again! Thank you for you generous donation! Without your help, Kid-U-Not, would not be able to help living organ donors in Connecticut! They are a group of topnotch attorneys. I'd refer John Wynne to any of my CT friends! Thank you so much for all of your hard work involving the case with my brother and I. We appreciate all of your communication and best of luck with your practice. I really appreciate your support throughout the case! I wanted to take a minute and thank you for all your hard work! Best of luck with all of your other cases! Thank you very much for being a corporate sponsor, your support is greatly appreciated! These guys take care of the working man! Thank you very much for taking care of the working man and being so caring and obtaining the agreement that you did with all parties involved. A great law firm, highly recommended!!! John went above and beyond! I sought out John Buckley to represent my interests when the likelihood of a satisfactory resolution seemed impossible. He is calm, personable and extremely professional, explaining each step of the process with integrity and transparency. John went above and beyond to ensure a great outcome and should I ever be in need of legal representation again, I wouldn't hesitate to call him. John Buckley is such a sweet soul and the best Attorney on the planet! He's honest, kind-hearted, and he keeps it real 100% of the time, no matter what! Your kindness and patience are without compare. John-Thank you so very much for the time and attention you put into Mom’s case. Your kindness and patience are without compare. The best firm in the world! The best firm in the world, do not bother looking any further! Thanks for serving as my attorney! Joe and I both appreciate that you believed in me! John Buckley handled a case for me and not once was he not available when I called with concerns or questions. If I ever again need an attorney I would not hesitate to call them. They are honest and fair with all their clients. Thank you gentleman for all you do! Thank you for helping my mom! I recommend Attorney Parese to all he did an awesome job for my dear mom when a drunk driver injured her. John Buckley is such a sweet soul and the best darn Attorney on the planet! He’s honest, kind hearted and did I mention he’s the best darn attorney? I would recommend this law firm to anyone! Attorney John Wynne helped with the personal injury case and we won because of him! The staff was attentive, including Mr. Wynne - I'd recommend this firm. Connecticut areas frequently serviced: Bridgeport, Bristol, Danbury, Fairfield, Greenwich, Hamden, Hartford, Manchester, New Haven, Norwalk, Stamford, Waterbury, and West Hartford. Click here to see all areas served.